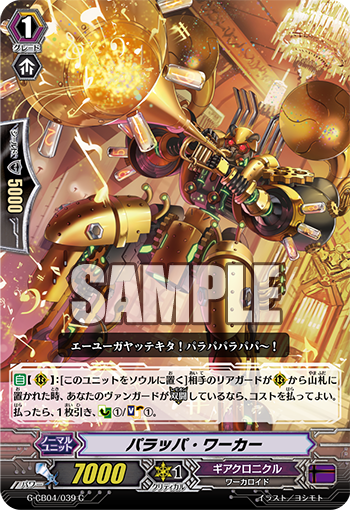 AUTO [R]: [Put this unit into your soul] When your opponent’s rear-guard is put into the deck from R, if your vanguard is in Legion, you may pay the cost. If you do, draw 1 card, and CC1/SC1. Today’s card we’re introducing is “Parappa Worker”, a Legion Support from the Clan Booster “Gears of Fate” (on sale September 30th, 2016)! “Parappa Worker”, when an opponent’s Rearguard is placed in an opponent’s Deck, can place itself into the Soul to Draw 1 card, Counter Charge 1 card and Soul Charge 1 card. It’s a handy card refills the hand and pays back its cost! Like other Legion Support introdced before, if you combine it with “Steam Maiden, Rimela” that can return an opponent’s Rearguard to the Deck, you can basically cancel out the cost while also meeting the conditions of activation. Advance your position in a profitable manner by returning troublesome opponent units to the Deck. Today’s “Weekly Vanguard Bits” will include a fight with Deck using cards from “Gears of Fate” and “True Zodiac Time Beasts”! Get yourself introduced to new 《Gear Chronicle》 Decks, so be sure you don’t miss that information!